Bill Hayes's critically acclaimed memoir Insomniac City provided a first look at his unique street photography. Now he presents an exquisite collection that captures the full range of his work and the magic of chance encounters in New York City. Hayes's "frank, beautiful, bewitching" street photographs "unmask their subjects' best and truest selves" (Jennifer Senior, New York Times)- A policeman pauses at the end of a day. Cooks sneak in cigarette breaks. A pair of movers plays cards on the back of a truck. Friends claim the sidewalk. Lovers embrace. A flame-haired girl gazes mysteriously into the lens. And park benches provide a setting for a couple of hunks, a mom and her baby, a stylish nonagenarian . 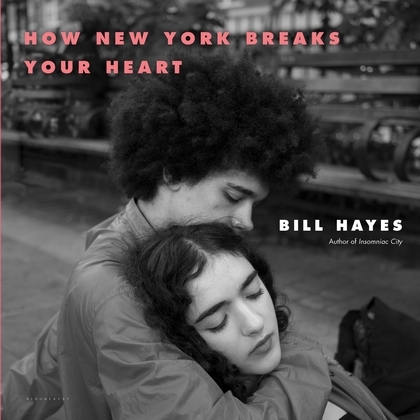 . .
How New York Breaks Your Heart reveals ordinary New Yorkers at their most peaceful, joyful, distracted, anxious, expressive, and at their most fleeting--bringing the texture of the city to vivid life. Woven through with Hayes's lyric reflections, these photos will, like the city itself, break your heart by asking you to fall in love. Bill Hayes is the author of Insomniac City, The Anatomist, Five Quarts, and Sleep Demons. He is a recipient of a Guggenheim Fellowship in nonfiction and was a visiting scholar at the American Academy in Rome. He is a frequent contributor to the New York Times, and his writing has appeared in the New York Review of Books, BuzzFeed, and the Guardian, among other publications. His photographs have been featured in Vanity Fair, the New York Times, and the New Yorker. He lives in New York.